The benefits from simpler track plans, longer sidings and building layouts in modules. Photos from the engineers seat showing the yard at East Hartford, CT. Adding simple features to add additional scope for operation. A first venture into EM with a British theme of a small shunting yard. The current magnetic couplers for British N gauge discussed, and showing how the addition of Micro-Trains American N couplings can be done to the Graham Farish 04 diesel shunter. Photographic essay of ex GWR goods yard, rural, simple and scenic, a real life 'tuning fork'. How a model of character can be built for light and narrow gauge railways. Suggested ways in which older layouts can be altered and refurbished. The 'Olympian' idea (73/19) reversed to make a American switching layout in HO serving a modern era frozen food facility, on two modules. 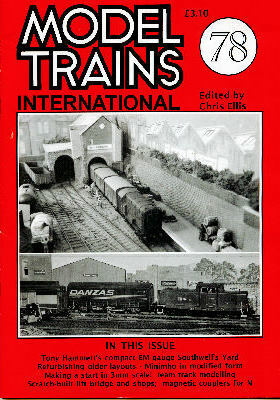 In 1:100 scale the author relates his experiences with photos. A busy American yard in HO modelled to a larger size. Buildings of character suitable for scratch-building and how to do it.